THE LINUX STUFF: Step by step Installing Tomcat 6 on Redhat Enterprise Linux. Step by step Installing Tomcat 6 on Redhat Enterprise Linux. 3. As root, insert following lines in /etc/profile. #vim /etc/profile --add below code.. The above installation step will not create tomcat service so that user can restart tomcat using command service tomcat restart. Create a new file in /etc/init.d as tomcat and copy following contenents into it. echo -n -e '\E[0;0m'"\033[1;32mStarting Tomcat: \033[0m \n"
echo -n -e '\E[0;0m'"\033[1;31mShutting down Tomcat: \033[m \n"
echo -n "tomcatd ( pid "
16. Add $CATALINA_HOME to /etc/profile. 18. 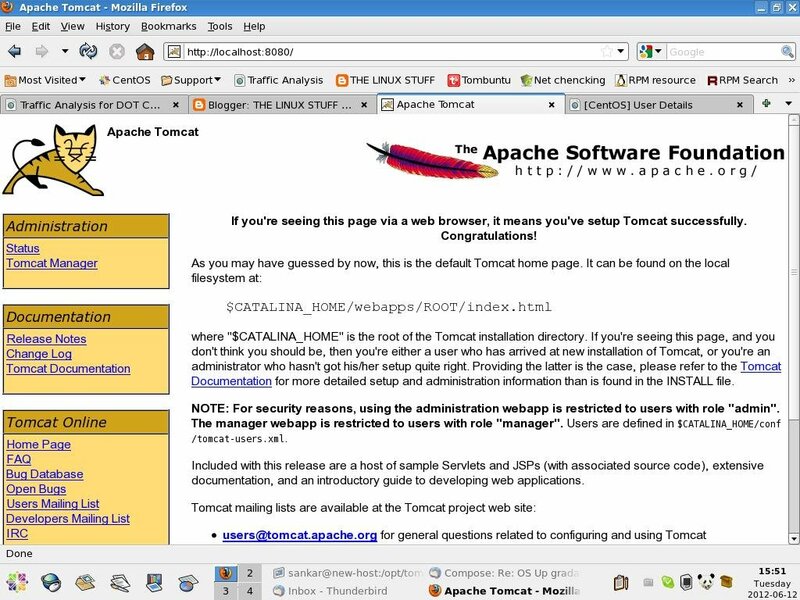 If the Apache Tomcat page can be found at http://localhost:8080, the installation is correct. 10) </tomcat-users>Restart tomcat server.By using service tomcat restart. and then untared (I know Linux guru, all those thing can e done with a single compact command line, but it take more time to read the man pages compared to run two separate and clear commenads). Now I need some script to run Tomcat as a deamon to put in /etc/init.d. I found a page (which i lost…) and modified the script to match my path. Pay attention: I need Tomcat to run on port 80, so I made it to run as root. If you want to make it run as another user (like tomact) but still responding on port 80, either you need to put in front of it Apache or add some (for me) strange rules to iptables. See http://www.davidghedini.com/pg/entry/install_tomcat_6_on_centos for more up-to-date info.